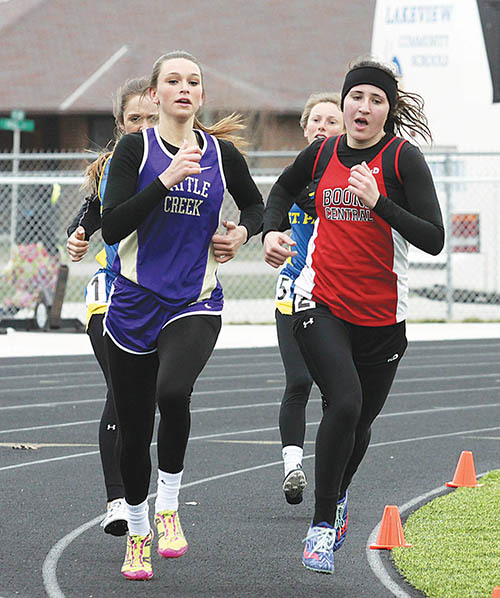 Cold temperatures, blustery wind and tough competition didn’t stop the Boone Central/Newman Grove Cardinals from posting some of their best efforts of the young track and field season Friday at the Central City Invitational. Led by freshman Jordan Stopak’s victories in the girls’ distance events, and gold medal performances by Jessie Sullivan and freshman Jonny Lindgren in boys’ events, the Cardinals racked up a total of 14 season-bests in the meet featuring traditional track and field powers Northwest and York, as well as strong St. Paul and Battle Creek teams and host Central City. With windchills dipping below 30 degrees before the end of the meet, Boone Central/Newman Grove Coach Kris Pestel was again pleased with the pluck of her Cards. 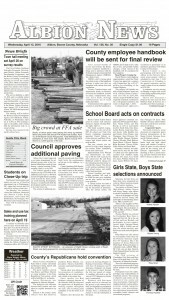 “Our kids again showed their toughness at Central City. We had some good performances in some not-so-nice weather conditions,” Pestel praised. “The girls were able to post five season-bests, and Leighann Miller broke the Newman Grove discus record for the second time this season. The boys had nine season-bests, and both teams finished fifth in team scoring. Stopak warmed the track with wins in the 1600 meter run (6:10.60) and 3200 metter run (12:48.34). Fellow freshman Lindgren won the boys 3200 meter run (11:04.43) and placed third in the 1600 meter run (5:07.88). Sullivan uncorked a season-best throw of 162’5 in the discus to win that event ahead of runner-up teammate Jon Merten (156’7). Sullivan placed second in the shot put (50’4½) behind York’s Masry Mapieu, with Merten finishing fifth (44’3). Freshman Samantha Weeder had a strong day, placing second in the 800 meter run (2:38.73), third in the 400 meter run (1:06.30), second in the high jump (4’10), and running a leg on the fourth-place 4×400 meter relay (4:44.62). Another Card frosh, Marysa Duerksen, was runner-up in the 300 meter hurdles (52.24) and sophomore Lauren Hedlund scored in four events (100 dash, 200 dash, 4×100 relay, 4×400 relay). Senior Cody Nelson placed third in the high jump with a season-best (6’2) and third in the 100 meter dash with a season-low (11.72). Scott Wright (9’6) was fourth in the pole vault and Seth Wright (9’) placed fifth.